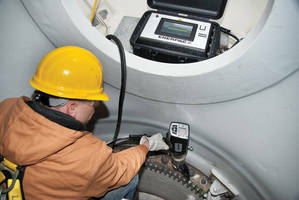 Electric Torque Wrenches combine continuous rotation, precision. ETW-SeriesÂ serves controlled bolting applications that require speed, precision, and traceability. Operation is via interactive 7 in.Â touchscreen, and UI helps operators simplify complex jobs by creating automatic presets that can be saved and applied on site. For simpler jobs, torque values may be input directly into rear control panel on wrench. Pass/fail indicator is also standard, and fastening records for each job can be viewed on touchscreen or exported to computer for traceability. Menomonee Falls, WI – Enerpac introduces its ETW-Series Electric Torque Wrenches. Designed to combine simplicity with smart bolting technology, the ETW-Series tools deliver fast, accurate and safe fastening for controlled bolting applications that require speed, precision and traceability. The ETW tools are operated with an interactive 7” touch-screen, which combines superior functionality with enhanced simplicity and ease of use. This user friendly interface helps operators simplify complex jobs by creating automatic presets, a sequence of torque and angle steps, which are input using the touchscreen, and may then be saved and applied on the jobsite. For simpler jobs, torque values may be input directly into the rear control panel on the wrench, allowing operators to monitor and manage the fastening process without returning to the control box. A pass/fail indicator on the rear control panel verifies that each fastening is made according the specified input. Fastening records for each job can be viewed on the touchscreen, or exported to a computer, providing a data record and traceability for all fastenings made. “The ETW-Series Torque wrenches are unique in that they are not only smart, but are also so intuitive and simple to use, that even operators who are unfamiliar with controlled bolting tools can begin using them minutes after opening the box with only minimal training,” said Kurt Huber, Enerpac Global Product Manager-Bolting. To accommodate diverse application requirements, the ETW-Series tools are available with a wide assortment of custom arms and accessories, including nose extensions for wheel bolts on off-road vehicles, reaction arms for deep sockets and sliding arms for variable bolt pitches. All ETW-Series Electric Torque Wrenches comply with regulations for electronic hand held tools, are CSA certified, CE declared, and are shipped complete with a unique calibration certificate, helping to ensure that each fastening was made accurately, and according to the specified input. For more information on the ETW-Series pneumatic torque wrenches, visit: enerpac.com.